Open positions are listed below. If there are not currently any positions open you are interested in we encourage you to bookmark our Careers page and check back. We would love to know you are out there so apply any time and we will keep your information on hand for our next opening that is a match for your skills. NRG Media’s five station group in Central Nebraska is looking for a Market Director of Sales. This person will lead the sales effort of not only our five terrestrial radio stations but their Streaming platforms and a myriad of other Digital assets plus live events including concerts, comedy shows, bridal events and much more. The right person for this rare opening will possess the talent to lead, motivate & direct our Account Executives and their activities in all these areas to reach our revenue goals. They should have proven track record of experience in maximizing a full complement of marketing inventory and multimedia solutions. NRG Media’s stations in Central Nebraska include the four highest rated FM’s in the Grand Island/Kearney/Hastings Nielsen rated market. We also have the Metro’s highest rated AM station complete with FM Translator. NRG’s brands in Central Nebraska include…KRNY-FM (Y102) Country & KQKY-FM (Hits 106) CHR, KGFW-AM & FM News/Talk/Sports all in Kearney, NE. Plus our Metro cluster includes KROR-FM (Classic Rock 101.5) & KSYZ-FM (107.7 The Island) Adult Hits in Grand Island, NE. Our NRG Stations in Central Nebraska are members of the Radio Advertising Bureau and the Nebraska Broadcasters Association. Essential Duties and Responsibilities for the Director of Sales position in Central Nebraska include the following and other duties as assigned. NRG Media is an Equal Opportunity Employer. 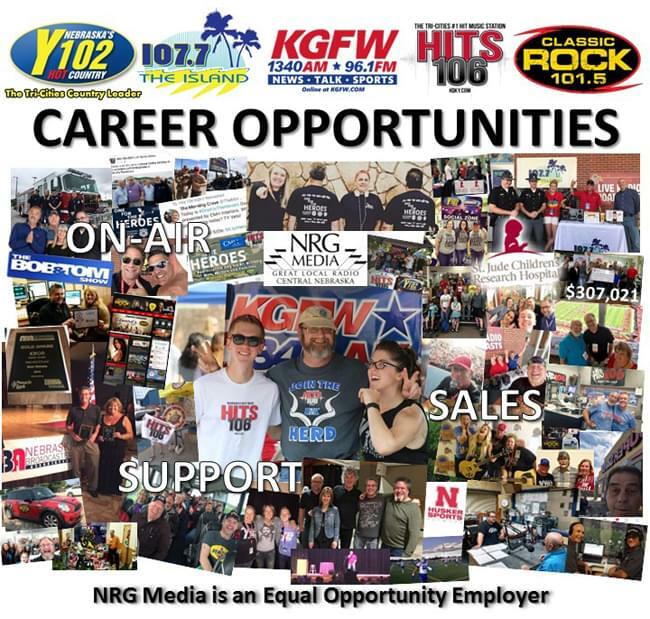 For more on this career opportunity at NRG Media click here. NRG Media’s five station group in Central Nebraska is looking for an Account Executive to be based out of our Grand Island studios. This is a fantastic career opportunity with excellent compensation potential for the right client focused person. This person will work with all five of our terrestrial radio stations, their streaming platforms and a myriad of other digital assets/multimedia solutions plus live events including concerts, comedy shows, bridal events and much more to help our clients grow their business. NRG Media’s stations in Central Nebraska include the four highest rated FM’s in the Grand Island/Kearney/Hastings Nielsen rated market. We also have the Metro’s highest rated AM station complete with FM Translator. NRG’s brands in Central Nebraska include…KRNY-FM (Y102) Country and KQKY-FM (Hits 106) CHR; KGFW-AM & FM News/Talk/Sports all in Kearney, NE. Plus our Metro cluster includes KROR-FM (Classic Rock 101.5) and KSYZ-FM (107.7 The Island) Adult Hits in Grand Island, NE. Our NRG Stations in Central Nebraska are members of the Radio Advertising Bureau and the Nebraska Broadcasters Association. NRG Media LLC is committed to equal employment opportunity. We provide equal employment opportunities to every applicant and employee. We base every hiring decision solely on applicant’s demonstration of ability, experience and training. Without regard to race, age, gender, sexual orientation, color, religious belief, national origin, marital status, veteran status or disability. NRG Media Central Nebraska operates five radio stations: KGFW-AM/FM, KRNY-FM, KQKY-FM, KROR-FM and KSYZ-FM. 1340AM and 96.1 FM KGFW has been serving Kearney and Buffalo County since 1927 as major source for News, Sports and Weather. Nebraska’s Hot Country Y102 KRNY is Central Nebraska’s Number one Country music station, serving the Tri Cites of Kearney, Hastings and Grand Island. 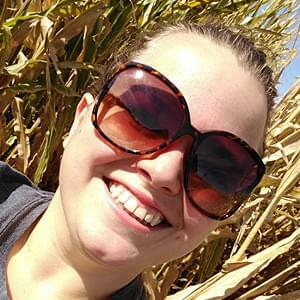 Y102 is where Country lives NOW in the Tri-Cities and Central Nebraska. Classic Rock 101.5 is the Tri-Cities Classic Rock station and home of Central Nebraska’s most fun and knowledgeable air personalities. Everything that is Classic Rock can be heard on Classic Rock 101.5. Any station openings will be posted below when they are available with information about the position and the requirements for the candidate we are seeking. Each opening will also include contact information and details on the deadline to apply. NRG Media, LLC is an Equal Opportunity Employer. NRG Media is dedicated to providing Great Local Radio and is committed to being an active and integral part of the communities in which it serves. NRG Media consists of over 45 radio stations throughout the Midwest in Iowa, Nebraska, Wisconsin, and Illinois. The company is headquartered in Cedar Rapids, Iowa, and led by President/CEO Mary Quass.